We are pleased to hear that, under the leadership of Mr T.F. Cottam and other gentlemen, a vigorous effort for the formation of a local football club for the winter season is being made, and a meeting in furtherance of the object was held at the Swan Hotel on Thursday evening last. There was a capital attendance, and the Rev. Thurston Rivington occupied the chair. 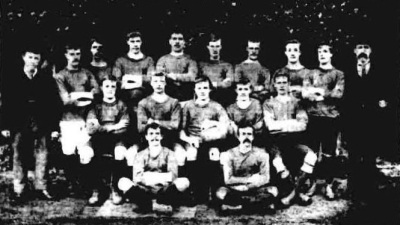 The formation of a Club, to be called “The Tewkesbury Football Club,” was decided upon, and the following were appointed as its officers: Mr Cottam, captain; Rev. G.D. Melhuish and Mr C.H. Tripp, hon secs; Rev. T. Rivington, treasurer; and Messrs. Field, Jordan, Heath, Brotheridge and E. Moore, committee. The days appointed for practice are Thursday and Saturday, at 3 p.m., in the Swilgate Meadow, which has been kindly lent by Mr B.T. Moore. Rugby Union Rules to be played. TEWKESBURY RUGBY CLUB. A general meeting of the above Club wax held at the Victoria Coffee Tavern on Thursday evening last, there being present:—Mr.C.Davis (Chairman), A.Edwards, K.H.Buckle, W.Moss, D.Moss, W.Robinson, Hathaway, E.Linnell, H.Kitching, F.Manning, A.Jackson, T.Bassett, W.Simms, J.Styles, etc., etc. The Chairman, in opening the meeting, said they had met together that night to start a Rugby Club in Tewkesbury. He said that Tewkesbury used to have a team that could hold their own with Glouceoter or Cheltenham, but through most of the players leaving the town, the Club fell through, but they had met to make an effort to start the Club again. Mr. Davis said he took great interest in the game, and he did not see why a club could not be started, (hear hear.) The Chairman then proposed that a Rugby Football Club be started in Tewkesbury, and this was carried unanimously. The Chairman then asked what could be the best name to call the club? 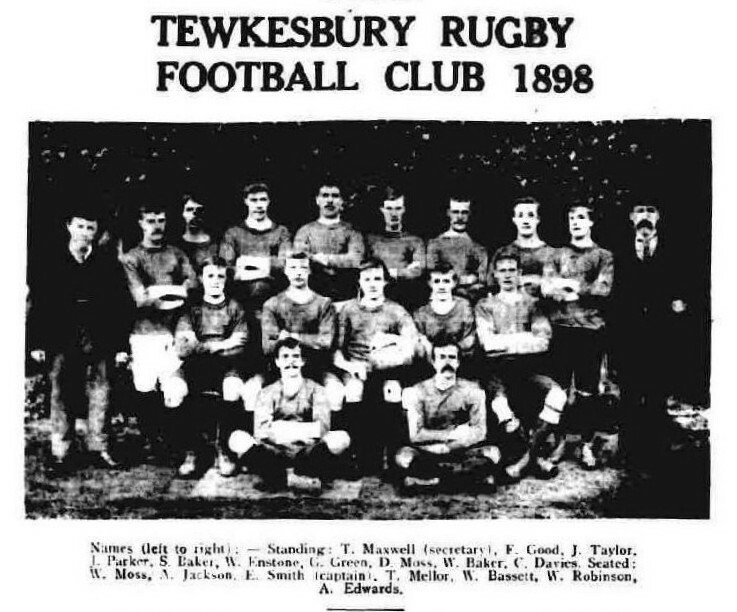 Mr. W.Robinson proposed that the Club be called the Tewkesbury Rugby Club. Mr. Moss seconded, and it was carried unanimously. The Chairman, in making a few remarks upon the name chosen, said he thought this was a fit and proper name for the Club, and he wished it every success, (hear, hear.) The next thing for discussion was the Head Quarters. Mr.Denman proposed, and Mr.Robinson seconded, that the Central "Coffee Tavern" be the head quarters, this was agreed to. The next item of business was the election of officers. The Chairman asked one of the gentlemen present to propose a captain. Mr. Hathaway proposed that Mr. W.Robinson be elected captain of the Club. Mr. D.Moss seconded and the proposition carried with enthusiasm. The Chairman remarked this was a good proposition, and he called upan Mr.Robinson to elect his sub, and he proposed Mr. W.Barnett, Mr.Lane seconded, and this was also carried, Mr.T.Bassett proposed Mr.Edwards as Hon. Sec., this also was carried. Mr. D.Harding was elected Assistant Hon. Sec. Mr.C. Davis proposed by Mr. H. Kitching, and seconded by Mr. Edwards, was elected Treasurer, and the following were elected committeemen, H.Kitching, D.Moss, Jenkins, Denman, and A.Jackson. Mr.Edwards then read a letter he had received from the Hon. Sec. of the Working Men's Club, saying that the Committee of the Working Men's Club could not find it convenient to let Mr. Edwards have the bottom room for the object he intended. It was resolved to approach the Rev.F.Langford-James, and ask him it he would kindly act as President for the Club. There was considerable discussion as to what the colours of the Club should be. There were four propositions made, Mr.D.Moss's proposition was that the colours be white shirts, with the Borough Coat of Arms sewn on and black knickers. This was accepted. Mr. J. Styles proposed the entrance fee for members be one shilling. Carried. This was all the business, and a hearty vote of thanks to the Chairman closed the meeting. Mr. A. Edwards, Hon. Sec., will be pleased to arrange fixtures, with teams, for next season.